Even in football obsessed Alabama, politics are everywhere ahead of next week's Senate race. MOBILE, Ala. — It's football season in a football-obsessed state, and it's Christmastime in a deeply Christian state. But next week's high-profile Senate race between Republican Roy Moore and Democratic Doug Jones is impossible to miss here. There are yard signs and giant "VOTE" billboards everywhere, political ads have been clogging the airwaves since the Republican primary this summer, and talk radio and the local media have been all over the battle. The contest may have slipped further down the front pages of local newspapers than when the sexual misconduct allegations against Moore first broke almost a month ago, but the race still makes A1 plenty of days. "Everyone is talking about it," said Cleo Berwick, 20-something and tattooed, as she poured drinks at what might be called a hipster dive bar here, where people were buzzing about the chance to elect a Democrat for a change in this heavily GOP state. And when Birmingham's Talk 99.5 opened the phone lines one morning recently to discuss the allegations against Moore, the host said they had a "full bank of calls — no one can get through." Adam Strange, the chairman of the Mobile County Republican Party and co-host of a local pro-Second Amendment radio show called "Armed Alabama," said people at this time of year would normally be talking about only two things: football and Christmas. "This year, there are probably three major things that people are talking about," he said, adding the Senate race to the conversation. His callers are overwhelmingly pro-Moore, but he's heard from others who are concerned about the allegations, and others still who just want the whole ugly affair to be over with. Election Day is Tuesday. Jones has been vastly outspending Moore on broadcast advertising. And the press, both local and national, has been treacherous for the Republican, so he's ignored them entirely and refused to answer questions. "I won’t talk to them because I have no respect for them anymore,” Moore told a Christian broadcaster in one of the few interviews he's given. The race always seems to be on the nightly news broadcasts across the state, and one can hardly get through a half hour of television on a local channel without seeing at least one or two political ads. Even in voters' homes, the Senate race will find them. Outside groups not affiliated with either campaign have spent about $700,000 on direct mail in the past week alone, according to an NBC News tally of FEC reports that have to be filed daily. Mailers from the Trump-aligned America First Action call Jones a "radical DC liberal," while one from the pro-Jones Highway 31 super PAC say Moore "ruled against victims of sexual assault and domestic violence multiple times." And those groups have spent about $38,000 on ads for Facebook and other social media media platforms since Dec. 1, according to the reports. Moore's campaign says it has made 200,000 voter calls and knocked on over 80,000 doors, while Jones' said that as of Monday, they had made 800,000 and knocked 100,000 doors. Jones has pummeled Moore with a barrage of negative ads that highlight everything from the sexual impropriety allegations to Moore’s alleged comparison of public education to Nazi indoctrination. They call Moore an "embarrassment" and imply he's chicken for not answering questions from the press. Moore's ads, meanwhile, have been fewer in number and somewhat less aggressive in tone. One accuses Jones of colluding with the "liberal elite" and the Republican establishment to cook up "false allegations" against Moore. Another features Trump's endorsement of Moore. He'll get some help from the combined roughly $1.5 million two outside conservative grounds have promised to spend backing Moore. Moore is pursuing a classic frontrunner's run-out-the-clock strategy to keep his campaign from making much news, which ends up tamping down coverage of the race overall, since Moore is the story. "This has always been a unipolar campaign," said former Alabama Democratic congressman Glen Browder. "It's about Roy Moore. Even when he was running against Luther Strange, it was about Roy Moore," he added, referring to the GOP primary. To get his message out, Moore has instead had to depend on allied outlets, including some from out-of-state, like Breitbart News, whose chairman Steve Bannon rallied with Moore here Tuesday night. "'Fake news' — we've got them all here today," Bannon said, calling out reporters in the back of the room as the crowd booed. And even the news and entertainment programs produced out-of-state, whether conservative, liberal or nonideological, are often about Alabama. So as Alabamians, like Americans everywhere, increasingly go online for news, they still can't get away from the race. Late night TV host Jimmy Kimmel's feud with Moore was a major source of interest, according to Google Trends, which has tracked sustained interest in the race. Still, despite all the attention, turnout is expected to be extremely low in the unusual election held 13 days before Christmas. 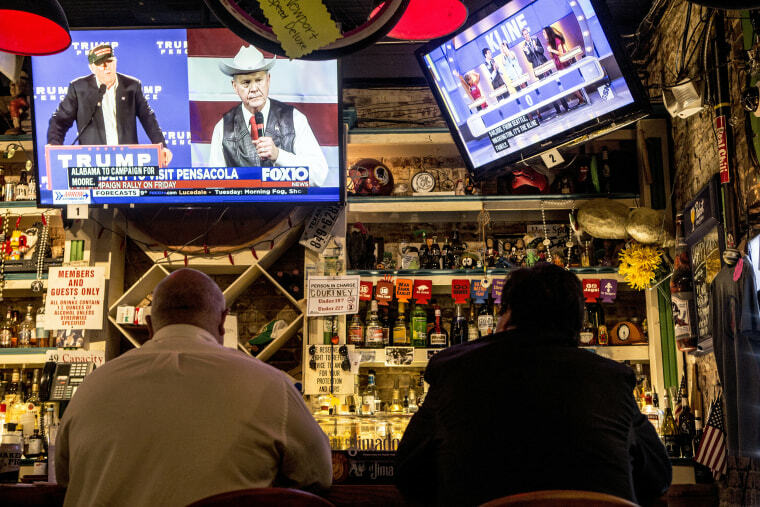 "I'm not sure that for the average person, for whom politics is not a priority, it will register for them that this is an Election Day," said Steve Flowers, a former Alabama Republican state legislator turned columnist.